GAP Student Discount Code – Up to 50% Off! There is currently a GAP sale with up to 50% off online! We’ve spotted some excellent savings on jackets, tops jeans, and lots more besides. 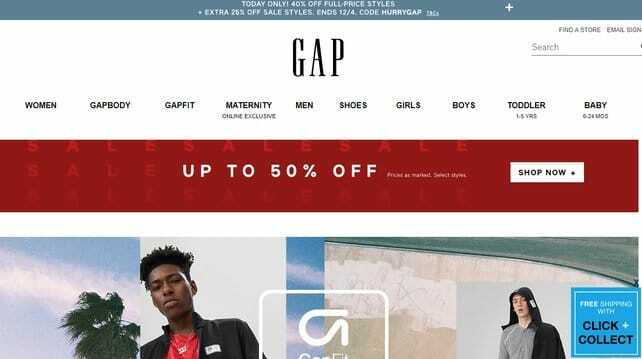 Plus, did you know students can get a 20% at gap.co.uk by signing up to the newsletter – just scroll to the bottom of the page. Also, if you’re instore you can get a 15% reduction through UNiDAYS. GAP (or The GAP as it’s also known) is THE destination for wardrobe basics for men and women. From jeans and tees to dresses and accessories, there is something for everyone. For students, there is usually some way to save online at gap.co.uk, take a look at our savings section which is regularly updated. Boohoo is purely online but has a great range of fashion and a juicy student discount. For huge savings Dorothy Perkins has lots of sales and a student discount scheme. Superdry is more of an urban vibe but has lots of fashion choices including jeans. For something a bit more upmarket, Joules has a student discount code and House of Fraser does has lovely clothing. And don’t forget Debenhams which has lots of student savings.